Bristol-Myers Squibb has claimed a new approval for its immuno-oncology combination of Opdivo and Yervoy, getting a green light from the European Medicines Agency (EMA) for its use in renal cell carcinoma (RCC), the most common form of kidney cancer. PD-1 inhibitor Opdivo (nivolumab) and CTLA4 inhibitor Yervoy (ipilimumab) have been approved for the first-line treatment of patients with intermediate- and poor-risk RCC, the first combination cancer immunotherapy for previously-untreated patients with this type of cancer in Europe. The clinical trial underpinning the new use for the combination – CheckMate-214 – was halted early after showing that the duo of Opdivo and low-dose Yervoy showed a significant increase in overall survival (OS) compared to standard therapy Sutent (sunitinib) from Pfizer, with a 37% cut in the risk of death in these patients. The objective response rate was 42% compared to 27% with Sutent, with a complete response in 9% versus 1%. The approval is a welcome boost for BMS as it tries to maintain momentum for Opdivo in the face of strong competition from MSD/Merck & Co’s Keytruda (pembrolizumab) – which has overtaken it in sales terms – and comes after the EMA’s Committee for Medicinal Products for Human Use (CHMP) rejected the drug for first-line kidney cancer last year. The US FDA approved the combination for this indication in April 2018, and with BMS already claiming market leadership in the second-line RCC category with a share upwards of 50%, plus a 30% share of the first-line market as a monotherapy, the first-line combination regimen gives it an opportunity to consolidate its position. It may not have too long before competition emerges, however, as Merck filed for approval of a Keytruda combination with Pfizer’s VEGF inhibitor Inlyta (axitinib) first-line RCC last October. Meanwhile, Merck KGaA and Pfizer are also carrying out late-stage testing of their PD-L1 inhibitor Bavencio (avelumab) with Inlyta in first-line RCC. 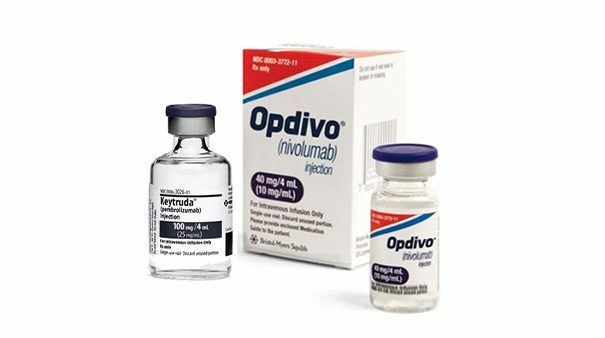 Keytruda overtook Opdivo in sales after it was approved in first-line lung cancer, an indication where Opdivo has had some trial setbacks, so BMS needs to expand in other areas to compete. Although EU approval has just come in, in the UK the National Institute for Health and Care Excellence (NICE) has already rejected Opdivo/Yervoy as an option for first-line RCC in draft guidance published last December. NICE said at the time that while clinical trial evidence shows that the combination is more effective than sunitinib in first-line RCC, it was uncertain whether the survival benefit would be maintained in the long-term.